A canister, or cylinder vacuum cleaner consists of a cleaning head and tube connected to the canister by a flexible suction hose. The canister, containing the motor and dust collector, is normally mounted on casters, making it easy to pull along during cleaning. It is more compact and lighter than upright models. The main cleaning head is often small, flat and light for cleaning beneath furniture. Whether designed for domestic or professional use, it usually has features such as an automatic cord winder, interchangeable brushes and other attachments, and adjustable hose to clean hard to reach areas. 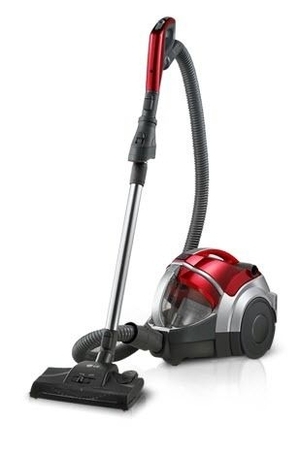 When choosing a canister vacuum cleaner, consider the capacity of the dust collector, the power of the motor, energy efficiency and weight. Other criteria include ease of use, length of the cord, the hose, noise and how easy it is to change or empty the bag and the filters. The size and configuration of the area to be vacuumed and the need for special attachments also should be taken into account.